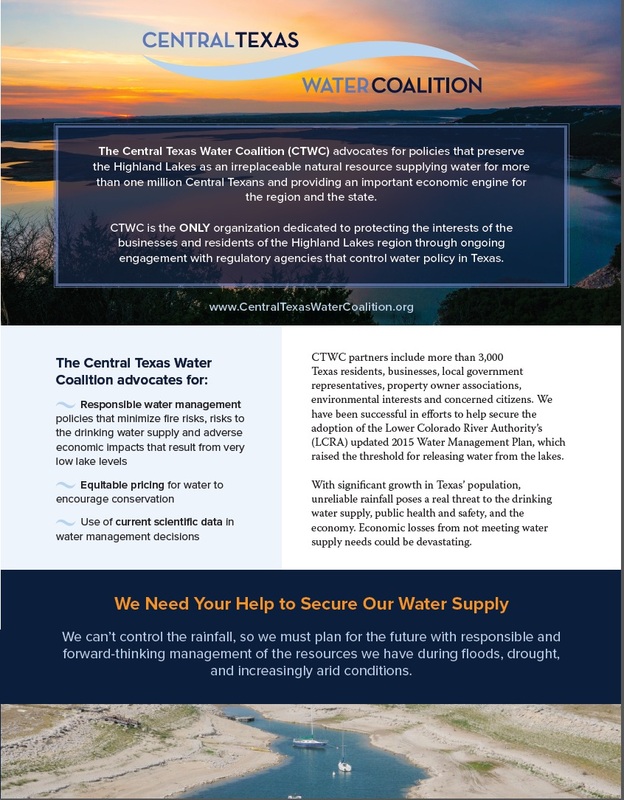 The Central Texas Water Coalition (CTWC) is a nonprofit organization advocating for policies that will preserve the Highland Lakes as irreplaceable natural resources that supply water for Central Texas’ more than two million residents and provide an important regional economic engine for the state of Texas. Partners of the coalition include lake residents, business owners, municipal officials, home owner associations, environmentalists and stakeholder organizations. All are united by their commitment to protect our future through responsible water management and conservation policies. Without action, CTWC partners realize the consequences could be dire. In May of 2010, the Lower Colorado River Authority (LCRA) formed the Water Management Plan Stakeholders Advisory Committee to assist in updating the management plan for Lakes Buchanan and Travis. The committee consists of 16 individuals representing diverse interests including cities, industry, lake-area businesses and residents, agriculture and the environment. After a year of meetings, it became apparent that not all viewed the lakes as a key water supply and economic engine for the region’s residents and businesses, but rather a source for large releases of water available at discounted prices far below what municipal, business and residential customers were paying. In response, business owners and lake residents participating in the advisory committee agreed it was time to mobilize lake interests to strengthen their ability to advocate for responsible water management policies. As a result, the Central Texas Water Coalition was formed and today it has emerged as a strong, respected and effective voice for lake interests. CTWC will bring together concerned individuals and groups to constructively address water issues of the Lower Colorado River Basin. CTWC’s primary mission is to advocate for the preservation and conservation of the Highland Lakes’ water supply and water levels for the benefit of human health, safety, and recreation, and to preserve the Highland Lakes’ role as an irreplaceable economic engine for the State of Texas. Tourism has taken a front seat in driving the economy of the Highland Lakes’ counties. Hundreds of thousands come to Burnet, Llano and Travis counties each year, taking advantage of the excellent boating, fishing, camping, cabins, lodges, Inns, spas, and dining opportunities. CTWC’s intent is to assist in all regional efforts to market the Highland Lakes, our most precious natural resource, as a tourism destination, directly impacting and increasing our economies. To view and download the CTWC informational publication, click on the image below. ~	Helped Secured Protective Emergency Orders from TCEQ: Participated in successful efforts to stop LCRA’s additional releases of water stored in the Highland Lakes from 2012-2015, the years of historic drought or Central Texans. ~	Raised Awareness of Unfair Pricing: CTWC demonstrated how rates play a role in water conservation. As a result, LCRA established a seven-year plan to phase in higher interruptible water rates, established surcharges for high usage, and began moving toward a full-cost rate for operating distribution canals. However, Interruptible raw water rates remain much lower than for Firm Customers. And, capital costs related to delivery are not passed on to Interruptible Customers as they are to Firm Customers.